As friendly, professional and helpful staff as we have encountered in our decades of travel. Among the team, Christina was especially considerate and informative. 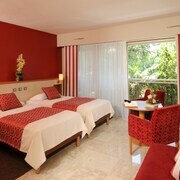 The rooms were well equipped and relaxing on the room balcony was a memorable occasion. The continental breakfast was equally superb- warm croissants and other patisseries were heavenly. Highly recommended escape with beach, pool and bar. Where to find Antibes hotels near an airport? 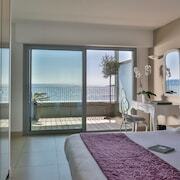 How can I find hotels in different Antibes neighborhoods? Where can I find hotels in Antibes that are near tourist attractions? Staying in Antibes? There's a selection of apartments and hotels for travelers to choose from. There are no less than 176 hotels within 0.1 kilometres (0.06 miles) of Antibes' downtown in our handy accommodation section. 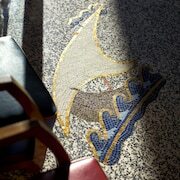 Among the more central lodgings of downtown Antibes are the Mas Djoliba and Hôtel des Mimosas. For those who plan to spend time at the Marineland Antibes and the Juan-les-Pins Beach while you are visiting Antibes, why not stay nearby? 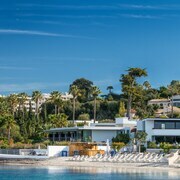 The Inter-Hotel Le Domaine du Jas and the Hôtel Baie des Anges are amongst the hotels that are near the Marineland Antibes. 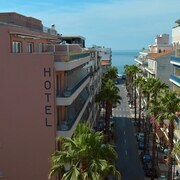 The Cap d Antibes Beach Hotel and the Hotel Belles Rives are closer to the Juan-les-Pins Beach. The Antibes area features a solid selection of economical hotel and apartment options sure to delight even the thriftiest vacationers and travelers. 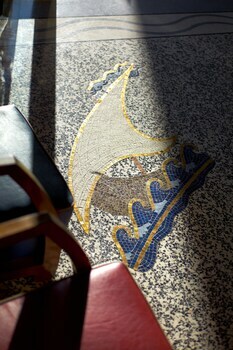 The Hotel Miramar is 4 kilometres (2 miles) from downtown, while the Hôtel Baie des Anges is 3 kilometres (2 miles) away. 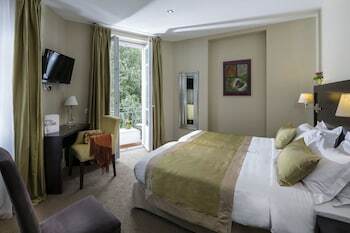 Different budget room options include the Hotel Le Petit Castel and the La Garoupe Gardiole. The Grand-Hôtel du Cap-Ferrat, A Four Seasons Hotel is situated 20 kilometres (13 miles) away from the center of Antibes. Another hotel is the Chateau De La Chevre D Or, which is situated 25 kilometres (16 miles) away. Two more places to rest your head include the Florella Croisette and the Chateau Eza. After you have spent time in Antibes, ensure you allow time explore Provence - Alpes - Cote d'Azur's other attractions. Investigate Provence - Alpes - Cote d'Azur's ruins and traditional villages. Lovers of the great outdoors could also take the time to admire its rural landscapes. Travelers in this section of France commonly enjoy picnicking, sunbathing and city walking tours. 9 kilometres (6 miles) to the southwest of Antibes is Cannes Marina - Le Suquet, where you can spend the day exploring Le Croisette Casino Barriere de Cannes and Musée de la Castre. Should you wish to visit Cannes Marina - Le Suquet, be sure to check out the Cannes Croisette Prestige and Grand Hyatt Cannes Hotel Martinez. Alternatively, you could consider staying at Golfe Juan - Vallauris, 4 kilometres (3 miles) to the west of Antibes, where you can choose from the JW Marriott Cannes and Hotel Regina. If you're staying in Golfe Juan - Vallauris, set aside some time to visit the Bouddha Beach and Musee de la Ceramique. Cote d'Azur Airport is a logical airport for flying into Antibes. It is 13 kilometres (8 miles) away. If you plan to stay nearby, try the Hotel Le Negresco or Radisson Blu Hotel, Nice. What are the most popular Antibes hotels? Are there hotels in other cities near Antibes? 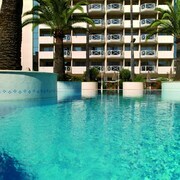 What other types of accommodations are available in Antibes? Explore Antibes with Expedia.ca’s Travel Guides to find the best flights, cars, holiday packages and more!